Welcome to installment 2 of the deck building series. Deck Design and Framing Concepts looks at the typical framing elements used in deck construction, the value of using pressure treated wood, and framing the understructure of the deck. In the first installment of the deck building series of articles, basic deck design fundamentals were discussed. Although the concepts presented here are generally accepted guidelines, always consult your local building code. Your decks understructure not only gives your deck its basic shape, but its strength as well. Its understructure is made up of joists, posts, and beams. Selecting the best and appropriate building materials is the basis for a long life. Wood: Be certain to select only pressure-treated lumber. In addition, its preferable that it should be treated with an insecticide; one that does a good job is chromated copper arsenate (CCA). As far as the wood itself is concerned, Douglas fir and southern pine are good choices. For added protection, its a good idea to brush on a brush preservative on wooden surfaces that you cut or drill. Concrete: Premixed concrete is your friend! Quikrete Fast Setting Concrete Mix is arguably the best product on the market and its easy to find. Your plan should be to use one to two bags for each post dependant upon post depth. And its always a great idea to dig your post holes about 3 deeper than needed and pour in a layer of pea gravel. Why? Because this will help with proper drainage away from the posts base. Rotten posts are a bad thing. Hardware and Fasteners: Count on using framing anchors, deck screws, bolts, and nails. All should be specially coated for todays pressure treated lumber; pay a few pennies more and make it last. Purchase your deck screws with an additional resin coating. If youre planning to build an attached deck, you will attach a 2 X 4 ledger board to the house; its important that it's absolutely level. A laser level is ideal for this. The ledger supports one side of your deck; the rest of your deck will be supported by 4 X 4 or 6 X 6 posts, depending on the size, height, and load. 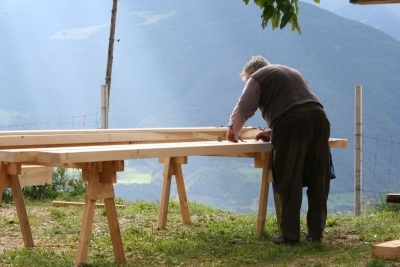 Your beams will be secured to the top of your posts and parallel to your ledger board. The total number of beams and rows of posts that you will install is dependant on the final size of your deck and how much weight load its expected to bear. Your floor joists will run from your outer beam to your ledger board. Hardware include joist hangers on your ledger board as well as post caps on your beams to lend support to your joists. A rim joist will be attached to the open end of your joists. A freestanding deck is basically the same as an attached deck except that in place of the ledger board, a beam and a row of posts are used. This construction method is ideal for building a shed. In locations where extended freezing periods are expected, your posts should be set at a minimum of 8 below the frost line. At the other extreme, in locations where there is no danger of freezing, posts may be attached to precast concrete pier blocks. Whichever method is used, always consult local building codes. This is just the second in a series of six articles in the deck design and building series (and other related topics). See the links below! Dont want to tackle the job yourself? Find thousands of unbiased ratings on services for home improvements, car repairs, and more. Find thousands of unbiased ratings on the best, and worst, service companies in your area. Try Angies List.